Continuation from the previous 89 parts, the whole series can be found at http://www.nikoport.com/columnstore/. This blog post is focusing on a very important improvement to the limitation of the In-Memory Columnstore Indexes that was existing in SQL Server 2016, but was solved in the Service Pack 1 – the possibility to add the Columnstore Indexes to the Memory-Optimised table as fast as the other indexes, be it Hash or Nonclustered BW-Tree index. 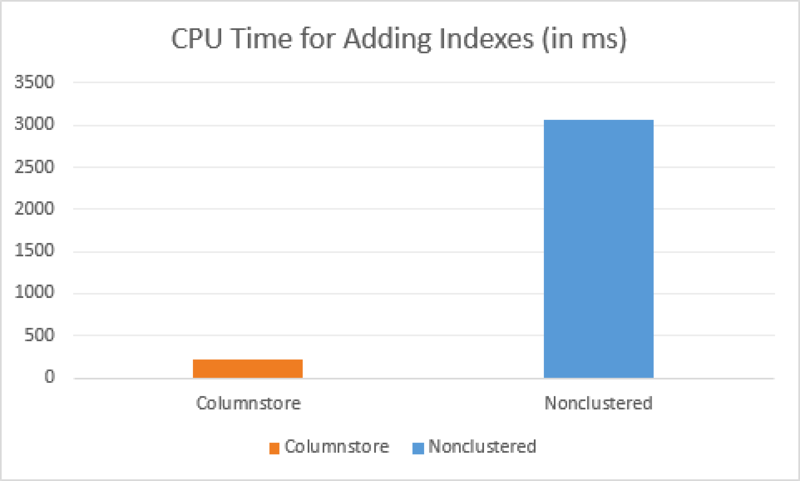 and in Columnstore Indexes – part 89 (“Memory-Optimised Columnstore Limitations 2016”), I have shown the impact to the persistent storage after adding Columnstore Index, which is doubling the occupied space of the original table, while the Nonclustered Indexes (Hash or BW-Tree) would simply add a couple of MB most probably reflecting the meta-information overhead. For the test, I will use an empty Memory-Optimised table where I shall load 2 million rows from the original FactOnlineSales table. You gotta put your cup of coffee down, before looking at the results: 218 ms of the CPU time and the total elapsed time was just 2064 ms ! The total elapsed time simply went down from over 7 seconds down to just 2 second! Regarding the used CPU time there is a huge difference with the original RTM CPU time being around 4.1 seconds vs 0.2 seconds in the Service Pack 1. Incredible! That is one amazing addition in “just a Service Pack”! Here we can see the the total size of the reserved space went from 476 MB to 526 MB, meaning that we have increased 50 MB in total, but the used space was kept intact on 328 MB in comparison to the RTM version where the 672 MB of the space were used. The difference here is huge with 0 MB vs 340 MB, justifying the impact of the operation speed. 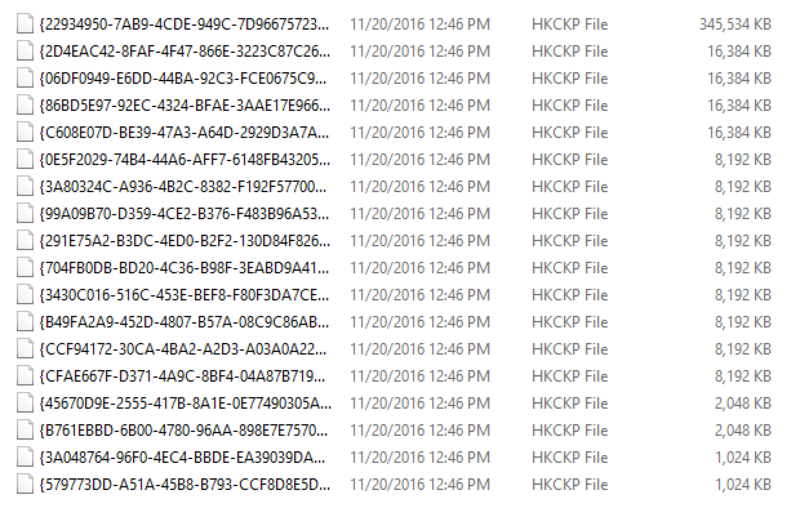 What about the changes for Nonclustered Hash Indexes? Are there any ? Let’s test the addition of the Nonclustered Hash Index to a Memory-Optimised table, but notice that for doing a fair comparison, all previous scripts besides Columnstore index addition should be re-executed again. The execution time was the same as for the RTM version of SQL Server 2016 – 2990 ms, while the CPU spent time was 3060 ms. This means that adding a Columnstore Index runs faster than adding a Nonclustered Hash Index, because we have 2 seconds for the Columnstore Index addition while having 3 seconds for Nonclustered Hash Index addition! That is quite a reversal of the fortune, when comparing to the RTM version! The amount of CPU time spent on the addition of the indexes has suffered a very significant change as well – it takes just 0.2 seconds of the CPU time to add a Columnstore Index while it takes a good 3 seconds to add a Nonclustered Hash Index to a Memory-Optimised Table. Additional note comes here on the addition of the Nonclustered BW-Tree Index, which spends 4.1 seconds on the total execution, while spending 3.2 of the CPU time – time making the worst time when compared with all other indexes. This time we have just received 16 MB of the reserved space and nothing from the point of view of the occupied space. Another interesting area for the investigation is the addition of the 1957 rows while adding a Columnstore Index while nothing changes when adding a Hash Index. I will be writing on this matter in the near future. 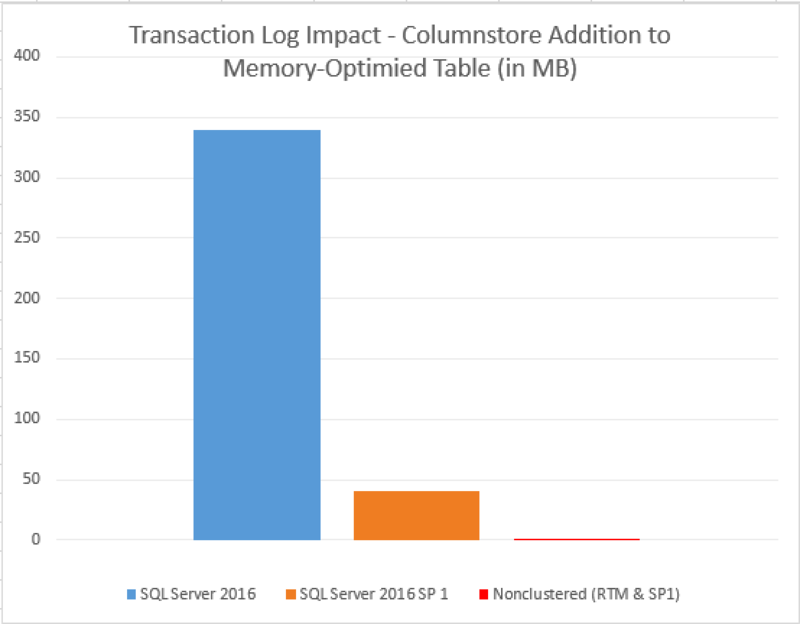 The impact on the transaction log when adding Columnstore Indexes continued to be quite significant, but in comparison of the SQL Server 2016 RTM version where it took 380 MB, in the Service Pack 1 the total impact on the transactional log went down to just 41 MB! Comparing to the addition of the Nonclustered Hash Index still can’t be truly done, since it is just around 260 KB (yes, Kilobytes) that transaction log receives after this operation, we are talking about difference in around 160 times. 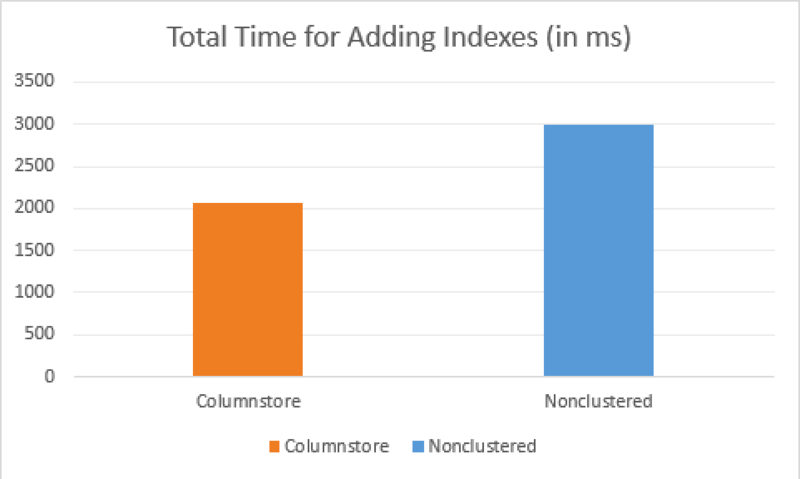 We can observe a truly great improvement with Columnstore Indexes in the Service Pack 1 and it is just another reason for upgrading to it, even if you are running SQL Server 2016 RTM. The next natural step will be guaranteeing that addition of the all indexes to Memory-Optimised table takes place online, in order to keep the business running without any interruption. Another aspect to keep on improving will be the transaction log – the improvements in Service Pack 1 are great but there is still enough room for the improvement. So it means in Sp1 we can add has indexes after columnstore index. even in SQL Server 2017 when you are using In-Memory table with Columnstore Index, you can not add or remove indexes, unless you remove the Columnstore Index.